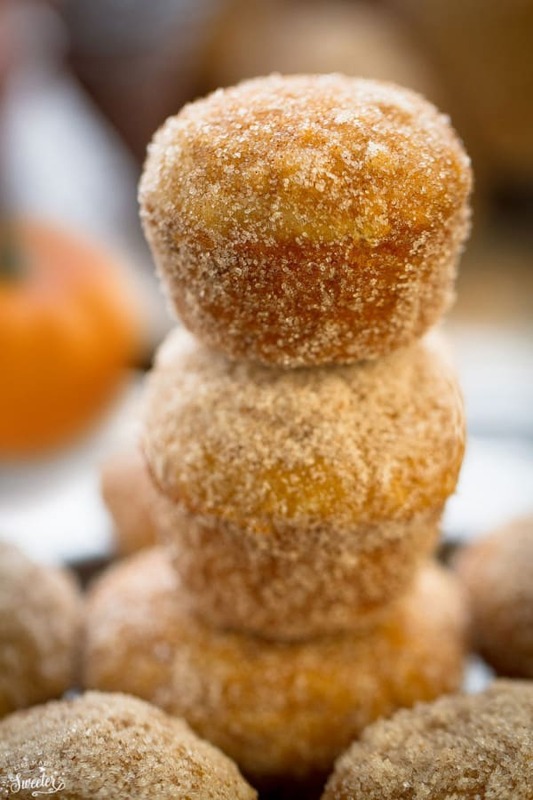 Pumpkin Nutella Donut Muffins with a cinnamon sugar coating and a surprise Nutella filling – tastes just like a mini doughnut from your favorite bakery! Fall just wouldn’t be complete without some pumpkin treats. It’s Monday and I brought along some Pumpkin Nutella Donut Muffins. 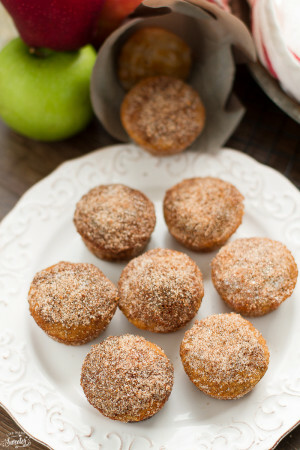 I actually made these little cuties back in August on the same day as these Apple Cider Donut Muffins. Since they were promptly devoured, we couldn’t help making three more batches. These delectable Pumpkin Nutella Donut Muffins are perfect for the fall season and are full of pumpkin and cozy warm spices in every bite. They’re soft, light and crusted with a crunchy cinnamon sugar coating. And that hidden Nutella filling that makes them seriously impossible to stop at just one. They’re also really easy to make using a simple muffin recipe. The batter is mixed together by hand in a matter of minutes so you won’t even have to use your mixer. You can either bake them in a donut pan or use a mini muffin pan to make these adorable little donut holes. A dollop of Nutella is added to the center just before popping them in the oven. They come out irresistibly cute with their miniature size and then we roll them in some melted butter and give them a good dousing of cinnamon sugar goodness. Soft, fluffy and dangerously addicting with their poppable size. These pillowy cuties are so fun to eat and make the best fall-time treat with your favorite cup of coffee. 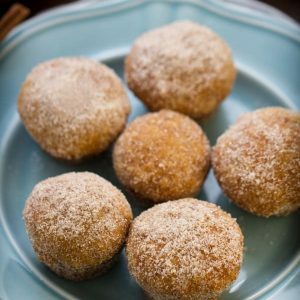 Delicious mini donut muffins baked with pumpkin puree, pumpkin pie spice, a Nutella filling and rolled in a generous cinnamon sugar coating. In a large bowl, whisk together the flour, baking powder, baking soda, cinnamon, pumpkin pie spice and salt together in a large bowl. Set aside. In a medium bowl, whisk together the egg, granulated sugar, and brown sugar together until smooth. Whisk in the melted butter, milk, pumpkin puree and vanilla. Pour the wet ingredients into the dry ingredients and gently stir with a spoon. Be careful not to over-mix or your muffins will become dense. Whisk until all ingredients are just combined. Fill each muffin cup 1/4 full. Dollop with a little bit less than 1/4 teaspoon of Nutella. Top with additional muffin batter filling the muffin cup 3/4 full. Smooth tops with the back of a spoon. Bake in preheated oven for 10-12 minutes or until a toothpick inserted in the center comes out clean. Meanwhile, make the topping. In a small bowl, mix the granulated sugar and cinnamon together. Remove donut muffins from the oven. Allow to cool for 10 minutes in the muffin tin before removing. 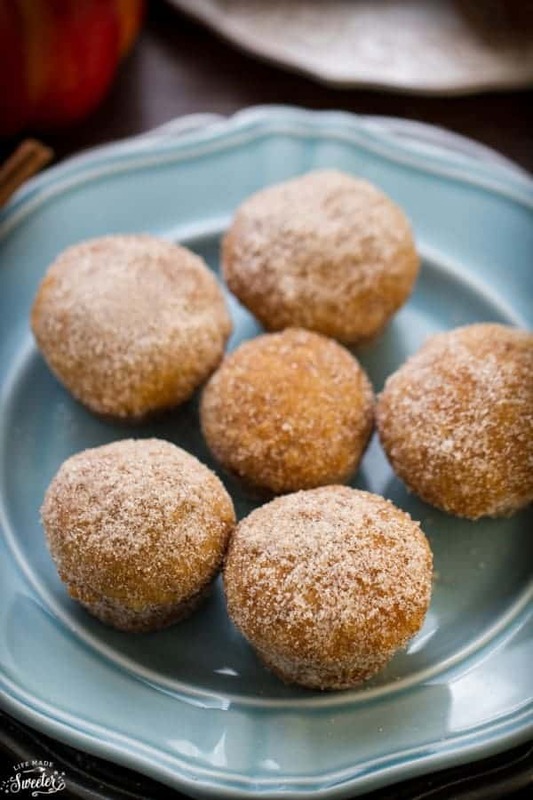 Dip the top of the donut muffins into the melted butter and roll them into the cinnamon sugar coating. Repeat with all the muffins. 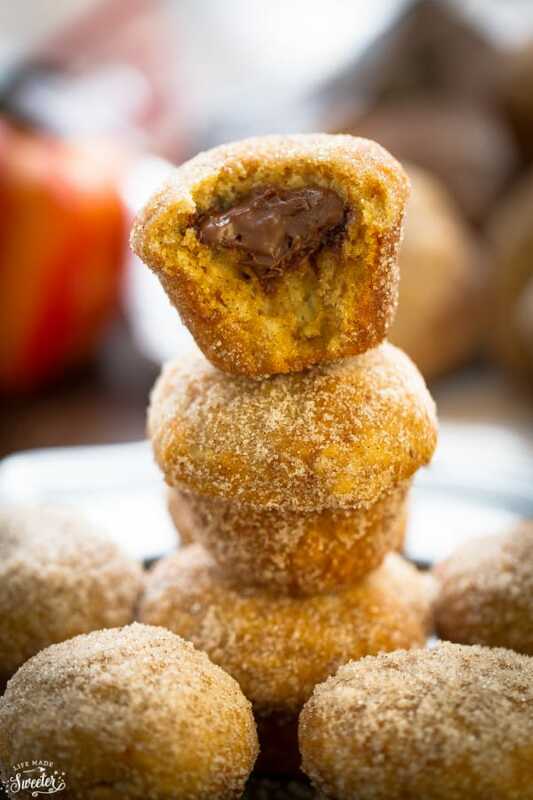 Donut muffins are definitely the best, especially ones filled with nutella! These look absolutely perfect, Kelly! I’m practically addicted to nutella, so these definitely wouldn’t last long in my house. What a perfect sweet treat! Yes please! I’ll take em all! Love the nutella center! Wish I had a couple to go with my coffee! You had me at mini, because I seriously SWOON over anything bite sized! But bite sized Donut Muffins? Stuffed with nutella and rolled in cinnamon sugar?? Yes, Yes, YEEEESSS! Perfection, Kelly! Pinned! Cheers, girlie! Donut muffins sounds incredibly yum, Kelly. And the stuffing of Nutella is beyond words! They are so perfect. Can’t wait to try. These look better than anything I have seen in most bakeries, Kelly! I adore these donut muffins! And that Nutella inside… SWOON! I must make these! What?!?! OMG! I want to eat the whole batch! so cute and delicious! Love that you stuffed these with nutella Kelly! How did you hold off on these that long! Love that surprise in the middle! Kelly, oh my gawd, these donut muffins look soooooo good!!! 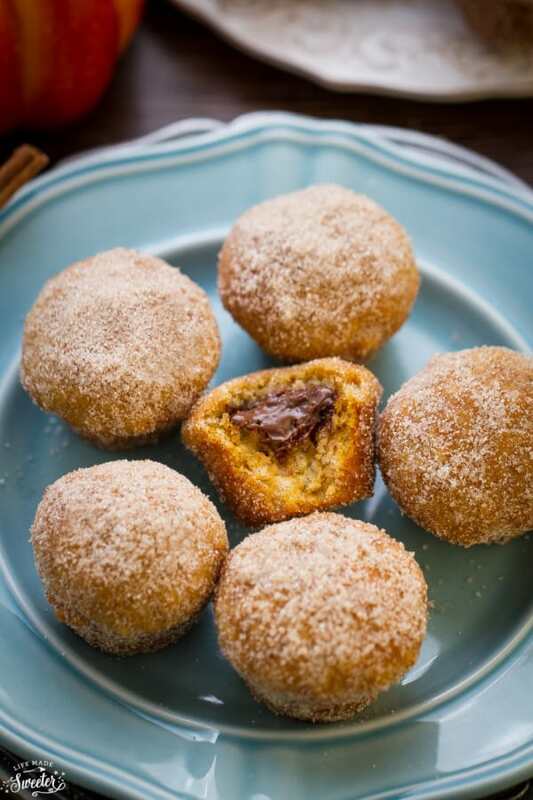 ah the crunchy cinnamon sugar coating and the hidden Nutella filling. . WOW!!! love these!! I need at least a dozen, Kelly. They look super duper delicious with nutella filling. These look absolutely amazing, Kelly!! 🙂 I’ve never heard of donut muffins before. What a great idea! I remember the other ones and these look even more irresistible with that Nutella filling inside! I love a good surprise like that! : ) Hope you are having a wonderful Thanksgiving. I can’t even imagine being ready to celebrate Thanksgiving right now but I hope you guys have a great day! There are so many amazing flavors going on in this pastry that I could cry. Cry from happiness, of course. Thank you for this delicious treat. I’m soooo not surprised that these were devoured in a day? They look absolutely gorgeous, Kelly! And Pumpkin + Nutella? I cannot wait to try that combo! I’m already salivating! Nutella with pumpkin sounds even better than chocolate with pumpkin! Have to try these! You had me at Nutella! So much to love about these delicious donut muffins Kelly! They look delicious! Oh my goodness! I was drooling from the title. I never thought to combine pumpkin and nutella, but that sounds amazing. Oh, that nutella filling! Serious obsessing going on over here! I definitely would not be able to resist popping numerous amounts of these muffins! They look so darn addicting! A bakery nearby makes donut muffins and I’ve always been intrigued. These look so yummy, and with that Nutella in the middle I think it would be hard to stop eating them! These donuts look amazing Kelly! I love the nutella stuffing in the middle. They sound delicious! I can finish a dozen of these donut muffins! Anything with Nutella has my name on it. And with pumpkin? It’s totally da best! Oh wow Kelly – you took a donut and made it into a fluffy muffin and then you stuffed it with Nutella – this is all sorts of foodpornagraphic! Gah how I love that hidden nutella center Kelly!! These donut muffins look so pop-able! 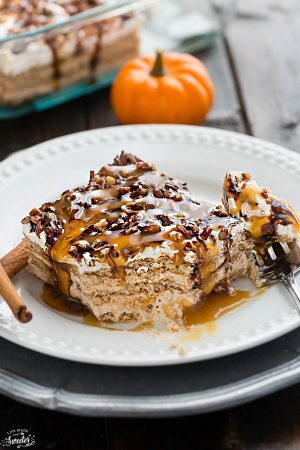 I’m just starting to get into pumpkin baking for the season … I need to add these to my list to try!! Kelly! These look incredible…so pillowy and fluffy <3 And that dollop of nutella is to die for! Plus no mixer? Woot!!! I just made apple donut muffins, but I’d totally pick these over mine everyday 😉 I think I went a little overboard with the topping and they didn’t save well :/ oh – and filling them with Nutella? Genius! These muffins look insanely good, Kelly! I could eat about a dozen, and really need to try these soon. I don’t buy Nutella often so it’s a real treat when we have it. These muffins look like the perfect reason to buy some more Nutella! They can be a little bit dangerous since it’s so easy to eat a dozen in one sitting 🙂 Thanks so much Marcie! These sound fantastic Kelly! What an awesome idea to make these in mini muffin pans!